It may not have been as much of an acid-induced experience of enlightenment for me as it was for the characters played by Peter Fonda and Dennis Hopper, but Easy Rider was a moment of reckoning in my personal development. It was also the final spark of inspiration that started me working on my first novel, Gris-Gris Daughter. Some credit should be given to Netflix. Without the impulse movie picking implicit with going to the movie store my wife and I filled our Netflix queue with more intelligent movie choices. 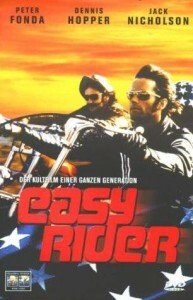 One otherwise nondescript Friday, the U.S. postal service delivered Easy Rider for our evening’s entertainment. Being a gen-x-er born in 1974 I had very little idea what to expect from the movie other than a couple of dudes on motorcycles taking some drugs. I mean, how can you go wrong with Peter Fonda, Dennis Hopper and Jack Nicholson? A bad-boy heartthrob and two of the craziest character actors to hit the screen? But I digress. The movie was fine. Spiritual journey of enlightenment, yada, yada. Freedom, bigotry, mother issues, blah, blah, blah. Who doesn’t like Mardi-gras? Honestly, it was watching the “making of” segment afterwards that woke me up and shook me. Not only was Dennis Hopper whacked out of his mind when in character, but while shooting and directing most of the movie. This in and of itself isn’t really surprising. It was 1969, right? But he and the rest of the crew had this crazy simple idea that the movie should be filmed while they rode across country. That they should live out what was on the screen as much as possible. They even chose to use regular, local people for as many of the extras as possible.